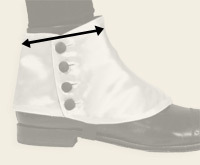 A pair of our Premium Men's Button Spats in white satin will add snap and spring to your step! Inspired by prior "spatterdashes" worn to keep mud out of walking boots, this pair is meant as an elegant accent for dress shoes. Cut from bright white satin (with a durable lining), our spats feature four white covered buttons and a black elastic stirrup designed to secure across bottom of the shoe. Fashioned from satin polyester with cotton lining. Imported. Dry clean. Available in sizes S-XL. These are very nice. They seem to be well made of a nice satin material. They fit well and really looked great. I measured my ankle to get the right size and it worked. All of my items look SO MUCH better in real life than on my computer monitor. Forget the fancy Clothing Shops with the occasional different tie or something for the man who wants to look good. Buy from Historical Emporium. You won't be Sorry. Great delivery and refund practices when things don't work out. 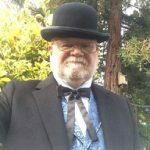 I ordered three Bayfield long-waisted vests (black, blue and tan) in small size, which is what I usually order for waistcoats. However, the Bayfield requires a larger size to fit over jeans and pants. The exchange was very easy and quick. I decided not to keep the tan vest because it seemed to be closer to moss in color, and the refund was prompt. I'm now looking at the Walden Tweed brown herringbone instead. I also ordered the Inverness Coat in gray herringbone tweed; it is well made and I like the color, but it is very long. I take a size 38R suit coat, so I ordered the small. But, the sleeves are about 3 inches too long, so I'm having them taken in. If there was an extra small version, I would switch.